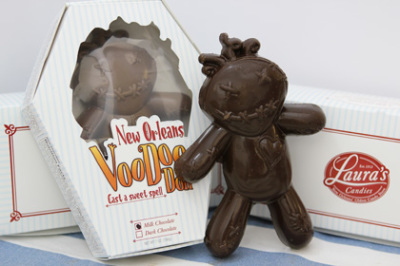 Laura's Voo Doo Doll is the sweetest one you'll find in New Orleans. This little guy comes in his own "coffin" box in either milk or dark chocolate. He makes a perfect gift for those who want to experience a "sweeter" side of New Orleans culture. One doll contains 8 oz. of chocolate.